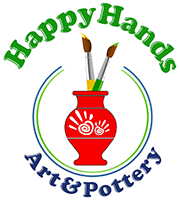 Happy Hands Art & Pottery is happy to support local non-profit organizations and causes. We offer several ways that can help you raise funds for your organization, school, or church. Come on in and experience the magic of pottery painting with us and your organization may qualify to receive a donation from our studio! One way we can support your organization or cause is to host a fundraising event with Happy Hands! Book your fundraiser at our studio and receive up to 15% of sales made during the event! Your supporters can enjoy a fundraising event of pottery painting at any of our three locations, all while raising money for your cause. ​​We'll be happy to follow-up with you and schedule your event! If you are looking for an easy donation for your fundraiser, Happy Hands can donate a gift card to any local non-profit organization that can be used toward a future visit to our studios. We require a Federal Tax ID and a formal donation request. Donation requests can be submitted online with our form below. All requests are subject to review and fund availability. Requests are not guaranteed approval. If approved, we will arrange for the pick up of the gift card donation. Upload forms or other important documents, if available.